Bionics Queensland will serve as a powerful facilitator of sector-wide growth in human bionics, physically located in Brisbane with intrastate, interstate and international ties. We will work with end users, carers and advocates throughout Queensland, bionics leaders and start-ups, the Herston Biofabrication Institute and our partners at the Herston Health Precinct and, we will collaborate across Australia’s leading universities. 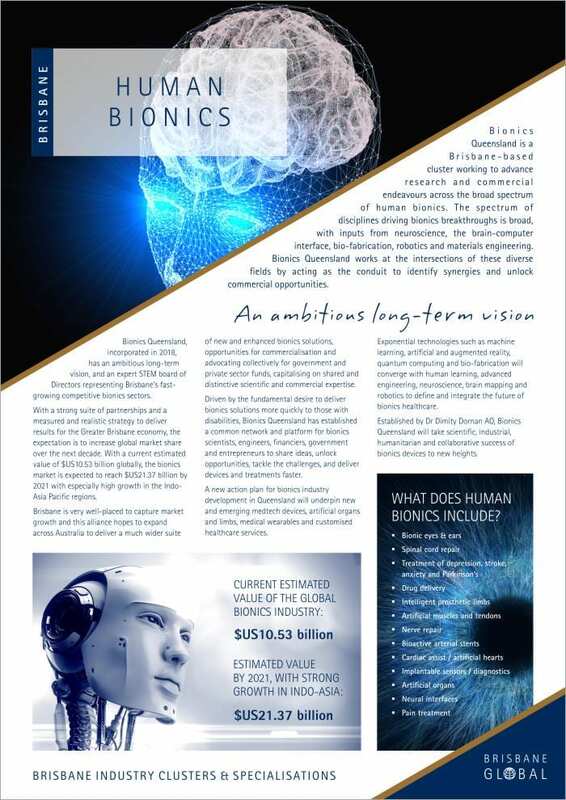 Our intent is to build a robust human bionics industry cluster in Queensland (https://rdabrisbane.org.au/trade-investment/human-bionics) that aligns with Queensland business and government objectives to proactively respond to the Health 5.0 revolution. We will also actively engage and collaborate with other Australian states and territories to create a globally recognised node of human bionics discovery and commercialisation to respond to Australia’s top 100 health needs.